Here are the results from the survey I ran 2 weeks ago about interest in the new batch of racing games that have come out. Also, shout out to the person who completed the survey as me from the future lol. Forza 7 was definitely the game with the most overall interest. The majority of people already had the game or have plans to buy it. There was still a good amount of interest in Project Cars 2, but a lot more people were uncertain about it or have no plans to buy it. Unfortunately, Gran Turismo Sport has very little interest. Which isn’t too surprising when comparing what systems people are playing on. The vast majority of people are playing on Xbox One, which I expected since during the past 5 years I’ve been on Oppo I’ve seen many more posts about Xbox related stuff than PS4 or even PC. In terms of events, the most popular options were organized series and one-off events, so me and anyone else running series will keep doing what we’re doing. For the random unscheduled stuff, just keep an eye out for posts on Oppo or more likely Digital Burnouts. And if you are interested in racing, also make sure to check out r/redditracing as they are also running fun racing series. Currently they are running V8 Supercars in Forza 6 as well as Spec Miata in Forza 7. So, the ongoing Can-Am Championship. Half of you just want me to call it off. However, out of those people, only one person has raced and/or shown interest in the series. Given that and the fact there are only 3 rounds left, I’m going to try and finish it out, with the last round falling sometime before Thanksgiving. For those of you who haven’t raced, I highly encourage you to do so. Even with low turnout there has been great racing all around. In terms of where to finish out the series, I’m not sure yet. 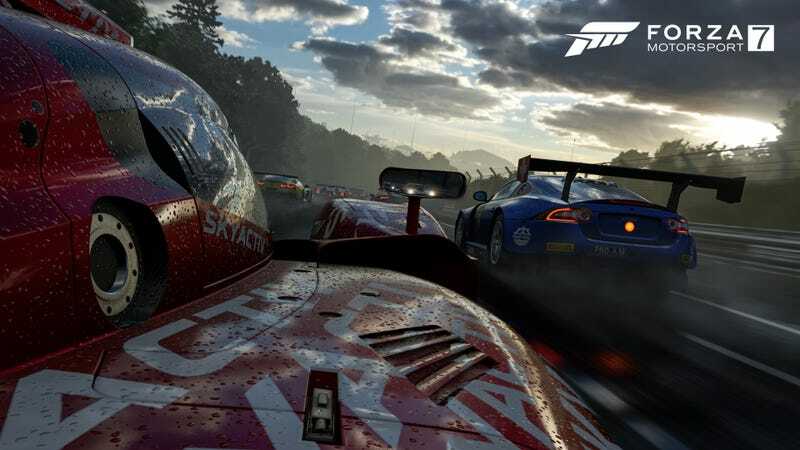 I can definitely say that round 6 will be on Forza 6, so if you want to give Forza 6 a sendoff before swapping completely to Forza 7, it will definitely be a fun race. After round 6, there is a distinct possibility I will move the series to Forza 7. r/redditracing’s Spec Miata series has shown there is a large following for Forza 7 at the moment, so it would make sense to move it to revive interest. However, that is dependent on me getting all of the series’ cars and BoP testing them in 7, which may or may not be able to happen in a reasonable time frame. If the series does make the jump, I’ll announce it here on Oppo so keep an eye out for that. Thank you to everyone who completed the survey! Hopefully we’ll get to race together soon.